Ever since I posted the article warning about the flood of new foreclosures heading towards the Tallahassee real estate market, I have received numerous questions and inquiries about the most likely impact on the market. Recently, somebody asked about the relationship between home sales and foreclosures, and it got me thinking about a new trend to track (and it is mildly disturbing to say the least). Would you be surprised if I told you that for every 100 homes sold in Tallahassee, there were 48 unrelated new foreclosures (lis pendens) filed? Would this make you very concerned about the future inventory of homes coming onto the market? The real estate graph above shows the one year trend of residential lis pendens filed versus home sales in Tallahassee. The same can be seen in the red line in the graph below. 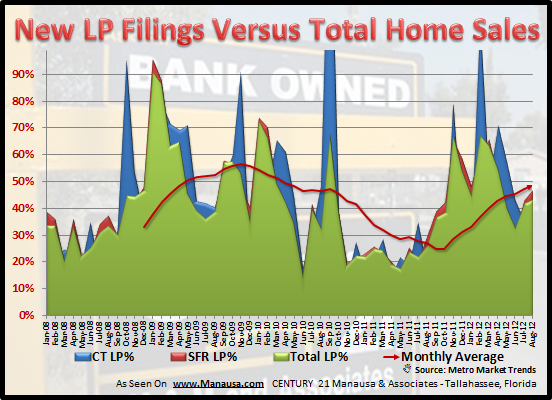 The graph above shows the overall comparison of new lis pendens filings versus home sales each month, including a segmented view of condo/townhouses and single family residential properties. The green area shows the overall ratio of new foreclosures to home sales, and the red line shows the monthly average has returned to 48% (or 48 new foreclosures for every 100 homes sold in Tallahassee). This is just more evidence that foreclosures and short sales will dominate the Tallahassee housing market in 2013. For everybody concerned about "dwindling" inventory levels, this report suggest that 1 out of every 2 homes sold will be returning to the market shortly, as a distressed property for sale in Tallahassee! Our market is still heavily involved in recovery, and we should ignore hyped reports that suggest that values are rising. Home values will begin to rise when a real estate market equilibrium is reached, and that won't occur until after we push these distressed properties through the market. If you think you have missed the bus on buying or selling a short sale home, I would tell you that is not the case. If you would like to know how to take this information on short sales and foreclosures and use it to your advantage, just drop me a note and we can schedule a time to review you specific situation and needs.